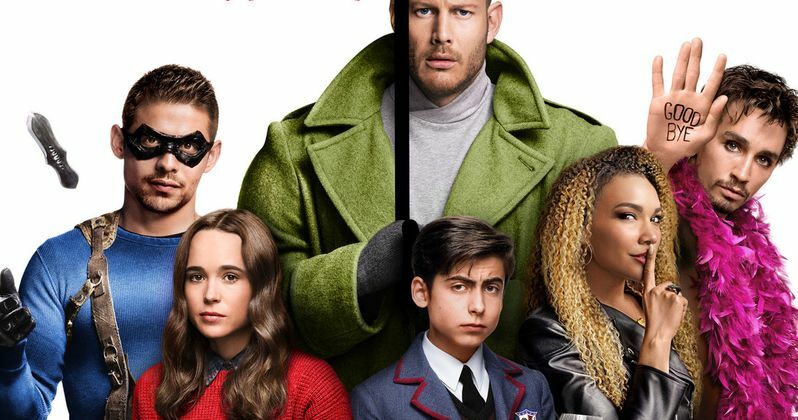 The latest trailer for Netflix's The Umbrella Academy goes even deeper into the dysfunctional family as they try and stop the impending apocalypse. In addition to the new footage, the trailer also provides us with some new music from source material creator Gerard Way. The former My Chemical Romance front man delivers a cover of Simon and Garfunkel's "Hazy Shade of Winter," but filtered through the Bangles' 1987 version of the tune from Less Than Zero. It's been a long time coming for The Umbrella Academy series, which was first announced by Netflix in 2015. However, Gerard Way is extremely pleased with the way that everything has worked out. Way created the comic series in 2007 and Gabriel Ba provided the illustrations, and Netflix brought them in as executive producers on the series and worked closely with them to make sure that they were getting the right feel for the look and the characters. Showrunner Steve Blackman also made some changes to the source material that Way completely agreed with. In a recent interview, Gerard Way was asked about the timing of The Umbrella Academy Netflix series. There are plenty of superhero movies and TV shows out, but this is a completely different look at the genre, one that Way doesn't think would have been possible to pull off a decade ago. Way believes that the current superhero movies are bringing the page to life on the big screen in a way that has never been seen and that's why now is the perfect time for The Umbrella Academy. He explains. "In the 10 years that's been out, we've had a lot of superhero movies, and I feel like some of them kept progressing forward and forward to the point where now we see a Marvel film and they're really bringing Jack Kirby and Stan Lee's world to life. It's really like a living, breathing comic book now. So people are ready to go deeper on superheroes to deal with dysfunction and demons and addiction, but you won't really find a comic going so deep in a mainstream comic." When speaking about some of the changes that The Umbrella Academy showrunner Steve Blackman made, Gerard Way is really happy that they changed Cha-Cha's gender to female and for the fact that Mary J. Blige agreed to play the part. The comic creator says that he was "blown away that she even wanted to have anything to do with something that I was making doodles of on airplanes." Way also says that she brings a lot to the role to make it her own. When asked about his favorite aspect of The Umbrella Academy, Gerard Way states that it's the characters and their relationships, which was the goal from the beginning. He notes that the dysfunctional characters drive the story, which is clearly evident from the latest trailer, which you can watch below, thanks to the Netflix streaming YouTube channel. The Umbrella Academy debuts February 15th, exclusively on Netflix.